I'm Duane Birkey and I lived in Ecuador for over 14 years. Ecuador is truly a beautiful country and within its borders are an incredible diversity of life, people and landscapes that provide thousands of photographic opportunities. This month we visit one of the best kept secrets in the Ecuador. It is an Island of the coast of Ecuador called Isla de la Plata, which translates to Silver Island. Isla de la Plata is an amazing place where you can see many sea birds including the Masked Booby, Red-billed Tropicbird, Frigate bird and the Blue-footed Booby. 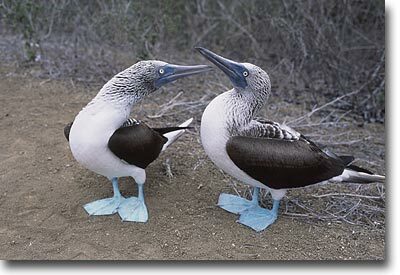 Of these birds, the Blue-footed Booby steals the show with it's bright blue feet that it proudly stomps while whistling and honking. Needless to say, the Blue-Footed Booby is a lot of fun to watch and photograph. In certain months of the year you may see a rare nesting Waved Albatross which can only be seen elsewhere on the Galapagos Islands. A special treat from May to October is to be able to see Humpback Whales around the Islands. Isla de la Plata makes for an incredible day trip and provides amazing opportunities to observe and photograph wildlife up close. All Images on this site and text Copyright Duane Birkey 2009. Absolutely All Rights Reserved. Images and text may not be posted on any website or reproduced in any form without written permission. Last update August 30, 2009.